This recipe reminds me of the "crustless quiche" that I used to make in my Weight Watchers days, except when I look at that recipe now it makes me sad: egg substitute, flour, reduced-calorie margarine, non-fat cottage cheese. However, I have taken the bones of that and made it into a wonderful Keto frittata. I am not giving the full macro count because you can put whatever you want into it to your heart's content. For my macronutrient count below, only the set ingredients (the bones) have counts, and by that I mean the eggs, cream, butter and the shredded cheese. Don't forget to add your counts for any meats and vegetables you are using. Before we start, though, I want to define frittata as opposed to quiche. A quiche is typically a savory egg custard dish baked in the oven. 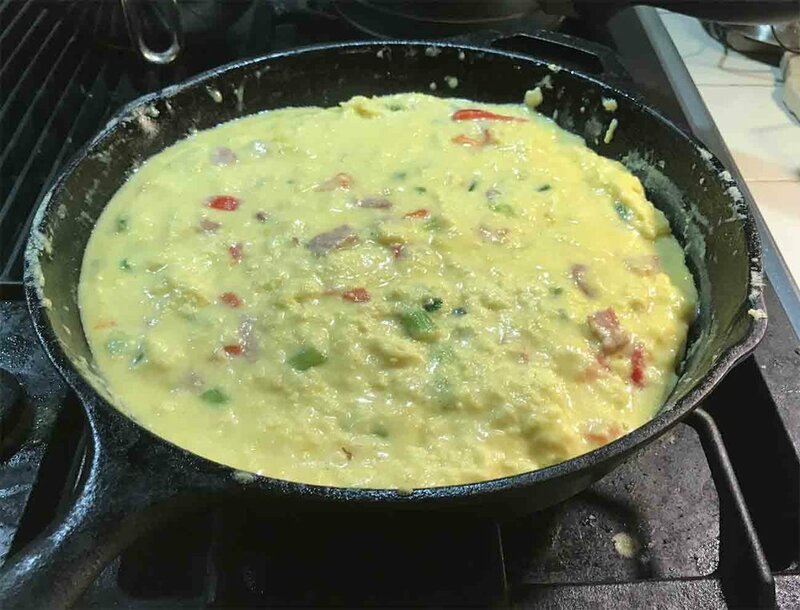 A frittata is more of an "open" (i.e., not folded over) omelette that can be done totally on the stove, done totally in the oven, or started on the stove until the eggs set, then finished in the oven. I am doing the last method here: starting on the stove and finishing in the oven. If you do it this way, I suggest that you do it in a cast iron skillet, or, not having that, at least do it in a skillet with a heat-resistant handle. I like to do it this way because I can add a little browning to the top by putting the oven on broil the last few minutes. 8 ounces hard cheese, grated: Cheddar, Monterey Jack (If you are going for that kick you can use Pepper Jack). Keep a little out to top the casserole if you are not using Parmesan. You can add all or some of these suggested ingredients. If you are leaning towards adding "all" ingredients, I suggest adding a couple more eggs. Optional spicy variation: If you want a little "kick," add 3–4 drops of red pepper sauce (Tabasco or something similar) and 1 small can of well-drained chopped green chiles. Melt the butter or bacon grease. On low, sauté any raw vegetables (about 5 minutes). Stirring intermittently, cook the mixture on low until the eggs begin to set (about 10 minutes). Bake approximately 30 minutes, but check to see that an inserted knife comes out dry. If you use the oven ONLY, increase baking time to 45 minutes and check for doneness. 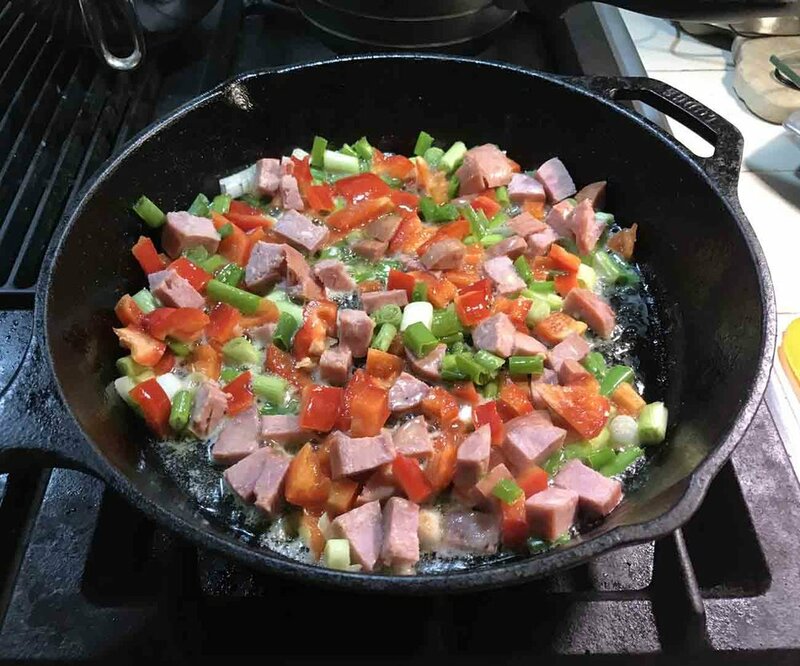 Take the pan out and top with a little bit of the cheese of your choice and a few sun-dried tomatoes, if using. Put pan back under the broiler for about 3 minutes, until golden brown. Turn oven on broil (high) and keep in for another 3–5 minutes.